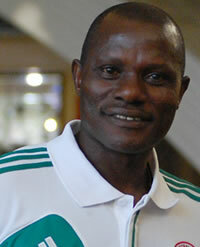 Super Eagles goalkeepers' trainer Alloy Agu on Monday lost his mother Mrs. Patricia Agu. Super Eagles media officer Toyin Ibitoye confirmed the sad news to newsmen on Tuesday. According to Ibitoye, Madam Agu passed away at the age of 85 years at about 4pm on Monday. Ibitoye said that burial arrangements for madam Agu will be communicated in a later date. During his playing career, Agu represented Nigeria at the FIFA U-20 World Cup in the former Soviet Union (now Russia) where the Flying Eagles finished third. With the senior national team, Agu was a member of the Super Eagles squad that won the 1994 Africa Cup of Nations in Tunisia. He was also part of the Eagles team to the 1994 FIFA World Cup in the United States of America.